This slot Rocks! Join the chaotic everyday life of the family Osbournes in one of the most popular slot machines from Microgaming. All the family members are involved in this great slot; Ozzy, Sharon, Kelly and Jack, not to forget the little dog Mini. The Osbournes is a 5 reeler with 20 lines for you to bet on. There are several bonus features available that are triggered by two different scatter symbols. This slot machine is based on the MTV series of the rock n’ roll legend Ozzy Osbourne’s family and it really brings the fun to the reels! Login and play, you’ll get a chance to win up to 300,000 coins in one of The Osbournes exciting free spin feature. The reels of the main game are set in the house of the Osbournes. The symbols are all family related and the colouring brings out the Beverly Hills type atmosphere. The background music is influenced by the hard rock music of Ozzy Osbourne. If you hit a win on the reels the electric guitar solo will increase in volume and add more excitement to the game. The main symbols are the family members; Ozzy, Sharon, Kelly and Jack. The Osbourne logo is the wild and it will substitute for all other symbols except for the two different scatters. The family dog, Mini, is one of the scatters and will trigger Mini’s Free Spin Trail Bonus if you hit three or more. The door knock symbol is the second scatter and will trigger the Knock Knock Bonus. The lower paying symbols are house objects like a photo of the family, an electric guitar and a microphone. Mini’s Free Spin Trail Bonus is triggered by three Mini scatters appearing on the 2nd, 3rd and 4th reel. This bonus feature can award you with up to 300,000 coins. 10 free spins are given with a X2 multiplier. The Knock Knock Bonus is triggered by the door knock scatter. This bonus feature includes a mystery multiplier that is randomly rewarded to you. The mystery multiplier can be anything between X2 and X5. The Knock Knock Bonus can reward you with up to 100,000 coins. The randomly triggered bonus feature is the Grab a Gift Bonus. In this feature your aim is to stop the reels on the gift that you wish to receive. 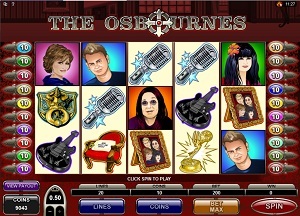 You can bet on 20 lines over the 5 reels in the Osbournes slot. The minimum bet is 0.01 coins per line and the maximum is 0.50 coins per line. If you click on the Expert button in the lower part of the game window, you may activate the auto play function which can be very comfortable to use.